Watch a video of Leanne's first flying day! 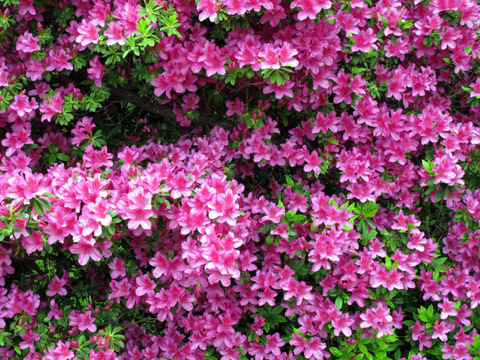 Azaleas at the top of Mt. Kotohira. The resplendence of these blooming bushes is synonymous with spring in southern Japan. I am not naturally athletic, and in fact, as a child, I was pretty pathetic in all physical endeavors. I was too uncoordinated to tie my sneakers, hit a baseball, tread water. Learning paragliding wasn’t much different. While practicing ground handling, my efforts to inflate the canopy failed repeatedly. Despite constant encouragement and suggestions from my teachers (don’t fight it, the wind is your friend!) I couldn’t fathom what I should do in order to get the silly thing to come up evenly over my head. 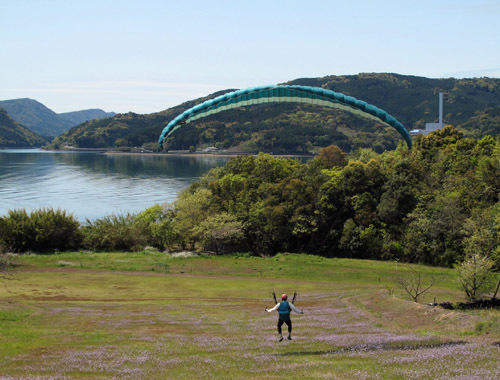 On weekends we kept going to Nagasaki, receiving coaching from some very talented paragliders. During the week I endured grueling practice sessions in an open field next to a local junior high school, not far from droves of kids undergoing their own regimented sports practice sessions. With the time commitment, hardship, and frustration involved, I have come to think of my training as boot camp. Finally after a month or so of military discipline, things seemed to be coming together. I could inflate the unruly sail over my head and even maneuver it somewhat. I began to think I was ready to fly. Last Sunday, on the dawn of a perfect spring day, we packed up our car as usual and headed to Nagasaki for the weekend. 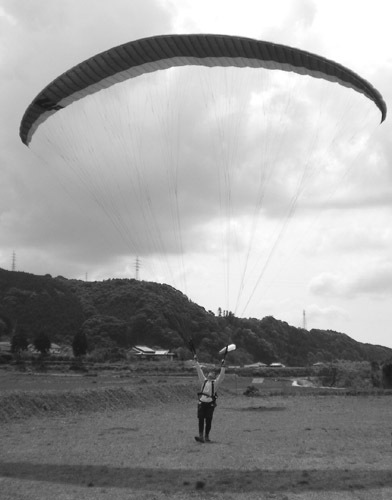 As soon as we arrived at the landing field, we unpacked our gliders and started to practice. H-sensei, one of our teachers, appeared and instructed everyone to pack up and head for the top of the mountain. I tentatively went over to him and asked him in an unsteady voice ‘Me too?’ to which he replied rather gruffly ‘No, not yet!’ I was perhaps a little relieved not to have to do my long anticipated solo flight. I refocused on honing my ground handling skills once again. One after another, paragliders seemed to take off effortlessly from the mountain above, floating down gently to the landing zone. In particular my husband was in his element, landing smoothly in the center of the LZ. Perhaps I am better off on land after all, I ruminated. 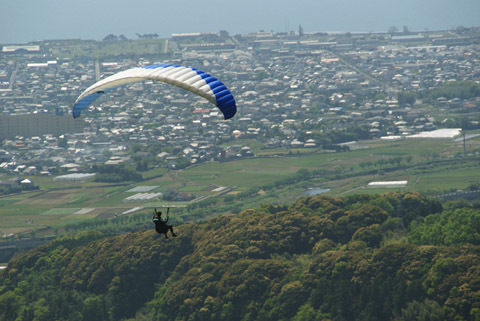 Resigning myself to another day of ground training, I laid out my glider carefully on the ground, only to hear H-sensei declaring "Leanne, pack up your equipment, you’re going up". The time had come. At just the right height, Sensei tells Leanne to turn onto the final approach. Leanne has followed his instructions perfectly, without rushing or panicking along the way, and is now in the perfect position to make a landing. At the mountaintop launch, everyone seemed to be rushing me to set up and get going. I couldn’t seem to move quickly in spite of my best efforts. 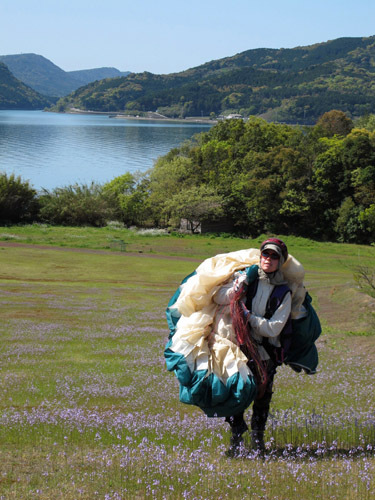 I hesitated; after all, did I really want to be flying off a mountain with only a big piece of nylon flapping over my head? My paragliding club mates gingerly set up my equipment for me, excited at the prospect of initiating yet another into their flock. Before I really had time to second guess myself, my canopy was inflated over my head, and I was off the mountaintop, soaring high in the air over trees, valleys, houses, fields, rivers. Below my feet, cars looked like ants creeping along their little curving tracks. Like in a dream, I felt the wind whistling in my ears. A cool breeze fanned across my face, snapping me back into reality. Soon the familiar voice of my teacher crackled reassuringly over the radio, ‘How are you doing, Leanne’, ‘Looking great up there, allright, now try and aim yourself toward the landing area.’ I felt my throat going dry as I focused on doing my best to obey his every command. I began to breathe deeply through my nose and out my mouth, like in yoga class. Whatever it took, I knew I had to keep things together until I had solid ground beneath my feet again. Soon I was closing in on the landing area, and I could see my teacher below waving his hand in the air. I had no time to panic or feel scared. Before I knew it I touched down on the soft turf right in front of my beaming teacher and my ecstatic husband. Don`t you worry Riki. I am just a couple of flights behind you. The weather forecast last Sunday was marginal with rain likely. 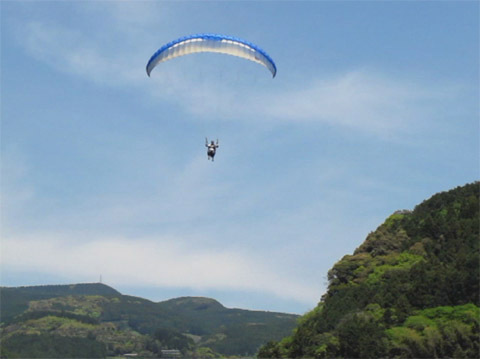 We went to Nagasaki mostly because Rick caught a glider on a tree branch, managing to tear one of the suspension lines. While small fabric tears can be repaired at home, line damage needs to be repaired professionally. These lines are less than 2mm thick and each can hold body weight. Rather than being knotted, they are attached by small sewn loops at their ends for maximum strength and their length is adjusted to millimeter precision, so that a line repair is not something one can normally do at home. The mishap emphasized the importance of treating the glider like your life depends on it (obviously! ); this too is a good lesson that every beginner must learn. 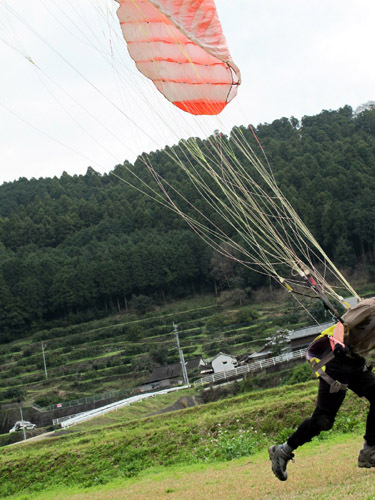 With some embarrassment we returned the glider to Mr. Y, our oyakata (guru) for repairs. In the end, were we ever glad we made the trip! Though the air was humid and light rain wafted down several times, conditions were in fact exceptional for flying, with the air buoyant yet smooth. The takeoff area had a gentle, steady uphill breeze – perfect! 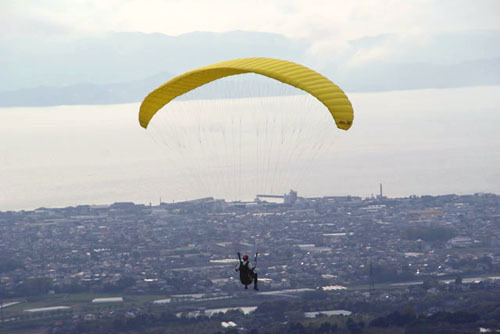 Several club members were able to soar hundreds of meters above the Mt. 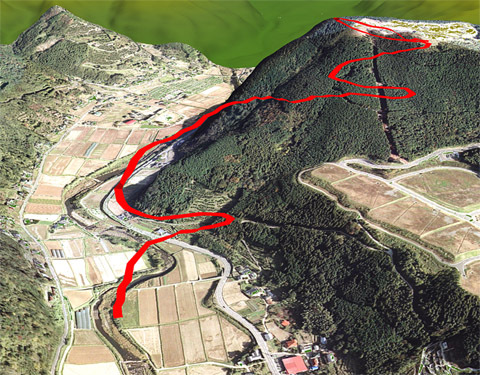 Kotohira’s 334 meter summit, while others immediately offered to take us on tandem flights. It was finally our turn to be lofted into the air by a glider! With a view toward the eventual first solo flight, I resolved to not get too nervous or excited by my tandem ride; I would instead try to soak in the sensory input and incorporate it into my sphere of comfortable surroundings. I had to wait, standing patiently and still for about ten minutes on the steep takeoff slope while my pilot waited for a good wind. Before me was an expansive view of the city of Omura with its eponymous bay swathed in the mists of early spring. Suddenly I noticed my heart beginning to race. My knees began to quiver; I convinced myself this was from standing in an awkward position, and tried to shift my feet somewhat to relieve the strain. Then suddenly, I was told, ‘Run!’ which I did, and a moment later we were in the air. A slight swaying motion first reminded me of riding on a ski lift, but seconds later the ground receded so far below my feet that there was no question we were flying. With an experienced pilot at the controls, I just sat there and stared. The unobstructed wide-angle view of the three-dimensional landscape slowly drifting by, the caress of a gentle stream of cool air on my face, the mesmerizing feeling of cutting a steep turn through the air…these are things that ought to be experienced at least once by everyone. If a jetliner is like a bus, a light single-engine plane like a car, a glider is like a bicycle coasting down a mountain road. Or a kayak following a rocky seashore slowly, closely, and quietly, traveling that special slice of space inaccessible to faster, motorized travel – a magic space where one can look at the world from the outside and yet not be removed from it. Video of Leanne's tandem ride. Enjoy! My effort to remain calm seemed to be successful and even after the landing, I did not sense much adrenaline. Instead, I felt light and free, not unlike after a yoga session. But even meditation could prepare me for what came next. 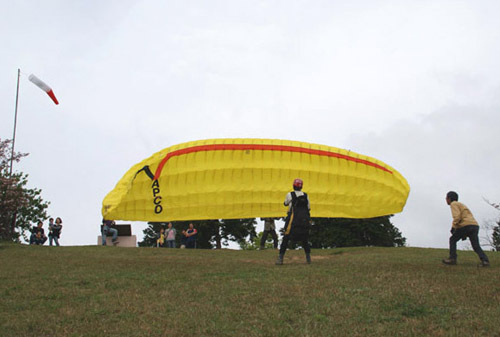 H-sensei, one of our respected instructors, brought me a new yellow canopy. Watching me practice the takeoff sequence several times at the landing zone, he proclaimed ‘Now you are going to fly’. About half a dozen club members immediately swarmed me, and before I knew it I was sitting in a car winding its way up the mountain road. 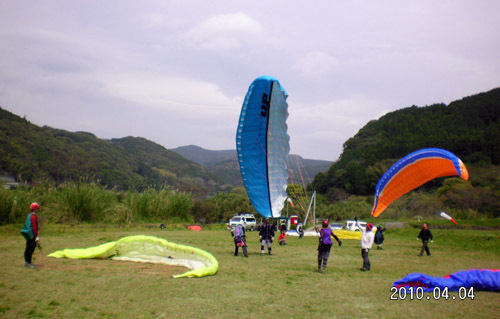 My new friends egged me on excitedly, their faces shining like schoolkids’: ‘Don’t worry, in Sensei’s hands, you can do this whole thing blindfolded!’ I should note that besides being a paraglider of exceptional talent, Sensei is also a radio control model freak. I would soon become his life size, if somewhat recalcitrant, flying dummy. Minutes later, I found myself once more on the steep mountaintop, the controls of a glider in my own hands this time. A month of solid practice was about to be put to the ultimate test. The wind was perfect and steady, and I too was somehow reassuringly calm. ‘Anytime you’re ready’. I double-checked that my lines weren’t tangled or wrapped around anywhere, though my friends had already done this for me. I tugged the glider into the air. It came up readily, but yawed slightly to the left. The moment of no return came and went: after a split-second of hesitation I turned around and let my legs propel me forcefully down the slope, following the glider with the reflex I had trained for weeks. One, two, three big steps and I was airborne. Unlike my earlier tandem flight, I now found myself focused on control, ignoring the view. Sensei’s voice came over the radio, telling me to turn toward the LZ; this I did without much trouble, but presently my brain became preoccupied with the slightest movements of the glider. It did fly more or less where it was told to, but never failed to remind me it also had a mind of its own. At times it would pitch a bit, and my keyed-up senses would duly amplify the sensation. A rush of wind in my ears, deceleration, a moment of silence, speeding up again…like a tree swing, but a hundred meters in the air! I was now to fly straight, and for a while there were no instructions on the radio. With nothing to do, I began to feel a bit nervous. I decided to try controlling the pitching with subtle movements of the toggles, remembering all the while not to make any sudden control inputs. Although this worked, it seemed to require too much mental effort, so after a short while I let the glider fly itself again. Now I was nearly over the LZ, and way high above it: several switchback turns would be required to shave off height. To wit, instructions from Sensei began pouring out the radio speaker, some a little difficult to make out over the distortion and the noise of the wind. Predictably, my turns were mostly too shallow: while I tried to follow Sensei’s commands to weight shift and pull on the toggles more, I also had to fight the sensation of plummeting into the inside of each turn. No matter: after three turns Sensei somehow compensated and brought me in to the final approach at just the perfect height. On final, as I steadily approached the ground and as well as the limit of my ability to cope, I noticed I was heading for the wrong rice paddy, but resigned to my fate; anyway I’ve seen other pilots land there before. But the radio crackled: ‘go right!’ I took this as a cue for a last-ditch maneuver. Just at this point, I suddenly regained an accurate judgment of the altitude and decided that a vigorous S-curve was in order before I got too close to the deck. ‘Too much, overcontrol!’ crackled the radio. I countered with the second turn, which luckily lined me up perfectly. I stood up in the harness, deploying my legs for the impending running touchdown. More guidance came from the radio but it was too much for me; anyway with only seconds left I became confident I could do the rest myself. My forward motion slowed to comfortable jogging speed as I pulled ever more brakes, but I began losing height rather quickly. With a meter or so left, I pulled both toggles all the way in a flare maneuver and a second later my feet touched the ground, light as a feather. I took a few more steps, turned around, and brought the glider down as I’ve practiced hundreds of time before. Still holding the toggles, my hands went up in victory. Watch a video of Rick's first flight! Besides the obvious problems of takeoff and landing, in-flight navigation is a big challenge for the novice flier. I found that although I did not pay the scenery much attention, my horizontal spatial awareness was automatic and accurate throughout the flight. Perhaps due to this, I was occasionally seized by worry about being steered downwind from the LZ. What if I couldn’t make it against the wind on the final? These perceptions may have come from my experience kayaking in strong currents, where it’s best to avoid being swept down the stream. But gliding is different: some downwind distance is essential for the final approach. It was also hard for me to judge what is perhaps the most crucial moment of the flight: the altitude from which to start the final. It happens seemingly too high off the ground for accurate judgment and it also depends on the strength of the wind. In the end, I glided in much steeper than I expected even though the wind was light. Without the radio instructions, I would probably have circled over the LZ, then landed in some other paddy upwind! Many thanks to Sensei for his excellent radio control. A couple of hours later, Sensei, Mr. Y, Leanne and I were relaxing in an outdoor hot spring, collectively dreaming of where we will go together on vacation. Switzerland, Turkey, Nepal? Any of these sounded pretty good. Afterall the sky is the limit! By popular demand, here is the English version, more or less, of our previous entry. Last month we began a new sport: Paragliding. It’s been a dream since a very long time ago. There is a place called Mt. Kotohira on the outskirts Omura City in Nagasaki that we pass by on our way to rock climbing, where we had often seen gliders floating around. 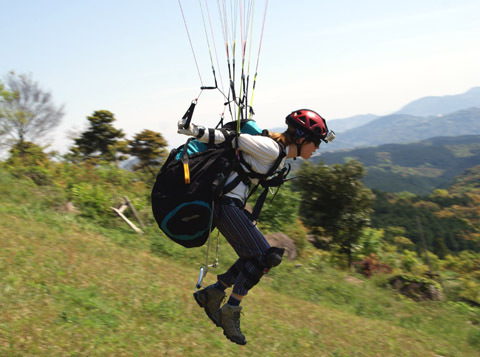 Several years ago we met one of the paragliding club members, Mr. Y. He is 73 years old, has completed nearly 1500 flights, and enjoys a vigor and health that many people half his age could be envious of. His friendliness and enthusiasm did much to make us come back and put a serious effort into learning this exciting sport. Sunday Flight School at Kotohira LZ. 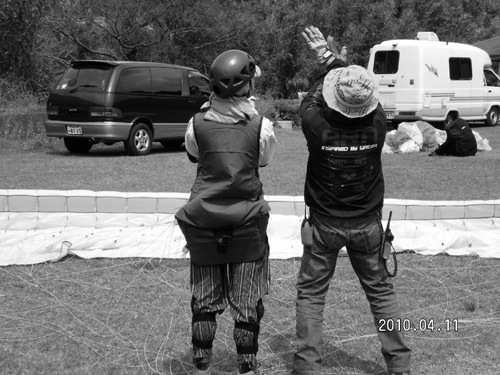 Mr. Y and his cohorts, Mr. K (who happens to be a high-ranking officer in the Japanese Self-Defence Forces) and Mr. N, a talented instructor with 20 years of experience, introduced us to a new world by letting us play with the equipment in the safety of the Kotohira Landing Zone (LZ). 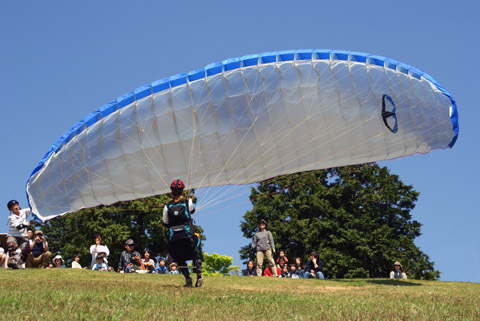 The paraglider is composed entirely of cloth and rope; its main part is an elegantly shaped canopy with a span of about 10 meters. The canopy cloth is similar to, but lighter than, tent fly cloth. It is composed of a number of interconnected cells, most of which also have air intakes at the leading edge of the wing. The surprisingly thin ropes (strings really) have an internal core of Dyneema, a fiber that is 40 times stronger than steel by weight. 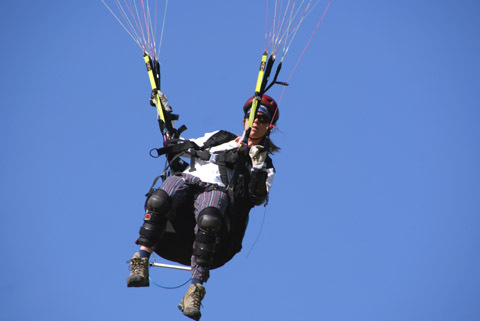 A few small metal pieces and some nylon webbing at the places where the glider attaches to the harness complete the setup. Although put together only with a sewing machine, each glider is a masterpiece of engineering and workmanship, designed and crafted with millimeter precision throughout. Weighing in at only a few kilograms, this amazing aircraft folds into a medium-sized backpack in a matter of minutes. But because it has no internal frame, it must rely on air pressure to inflate and keep its shape. This pressure cannot develop without speed relative to the air, so the first step before flying is to raise and inflate the canopy over one’s head and into the wind. 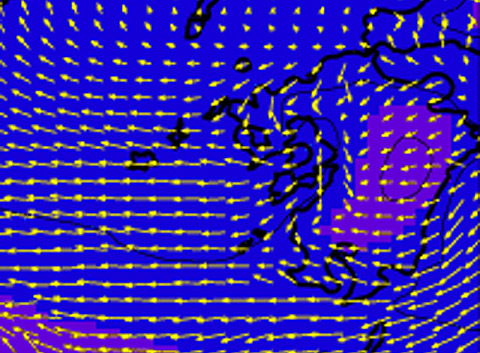 This is much more easily said (and watched) than done: the canopy is fickle, bein g very sensitive to deviations in control symmetry, not to mention the vicissitudes of the wind. In spite of hours of earnest practice, we were not able to raise the glider with any consistency on our first day. Purely by luck, Leanne’s canopy did come up straight a few times. Pushed heartily from behind by N-sensei, she even rose about 60cm into the air, much to her surprise. 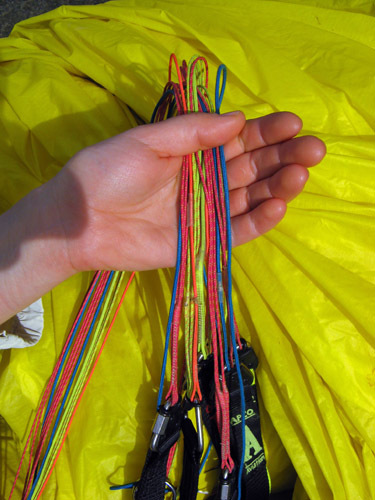 The suspension lines of a paraglider are coded by color for ease of recognition during maneuvers. Returning home after that first day, we thought about the causes of our lack of success. The glider’s motion was too subtle and fast to think about; successful control must be reflexive. One day of practice helped us understand the glider; now it was time to develop the correct reflexes through image training. 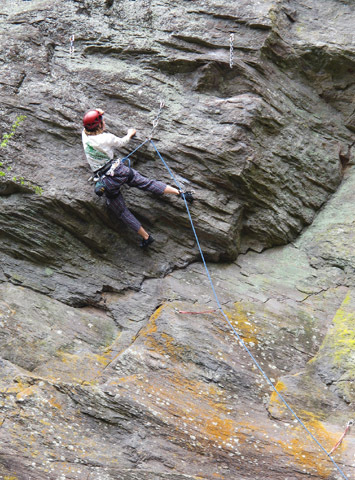 We spent a number of afternoons running around various parks wearing our climbing harnesses, suspending ourselves in various ways with carabiners and slings, simulating the necessary body English. We even used a bamboo pole to mimic the movements of the suspension in two dimensions. To avoid raising public concern about our mental health, we did these exercises mostly in disused recreational areas, of which, sad to say, there are plenty around here. Rick even applied his programming skills and built a simple computer simulation where one tries to control a graphic resembling the canopy in shape and behavior. O-sensei, chief instructor and president of the club, makes sure Leanne is perfectly aligned for a practice launch. Leanne gets pointers on launching technique from N-Sensei. An interesting way to practice is to hold the risers in hand rather than attaching them to the harness. Brakes cannot be used, so the only control is the differential pull on the risers and body positioning. You get an appreciation of the effect weigh-shifting has on the glider. You also really feel the lift the glider is generating as it stretches your arms - and it's a great feeling! All this image training was designed to overcome a particular reflexive problem we had identified. Consider the control of vehicles we are used to (cars, bicycles, kayaks). When the vehicle spontaneously goes in a direction we do not want it to, we apply a certain amount of force in the opposite direction: turning the steering wheel, handlebar, or pushing with the paddle to bring things back in line. But a glider will not react favorably to such control inputs. This is because of two factors: its response is somewhat delayed, and it needs to bank to turn. Fighting with a device that is powerful enough to easily lift you off the ground is obviously not going to yield success: the harder you pull, the harder the glider pulls back, until it (and possibly you also) comes crashing down to the ground. So when it deviates from the desired course, at first one has to run after the glider, overshoot it to give it the necessary bank in the opposite direction, all the while controlling it with the brake toggle in the direction of the desired turn. All this is incredibly counterintuitive: feeling the glider pull to the side, we ran in the wrong direction and/or pulled the wrong toggle virtually every time, with predictable results. Our exercises and computer simulation were designed to reprogram our reflexes, and to this end they were eventually successful. Getting a tiny bit of air at a gentle slope we recently discovered at an abandoned park. This is a very safe and realistic way to practice launches.